Our team building programmes provide realistic experiences which empower individuals to contribute to common goals. The success of most organisations depends on the ability of individuals to build effective teams and the main goals of team building are to improve productivity and motivation. Taking employees out of the office helps groups break down political and personal barriers, eliminate distractions and have fun. Our programmes are bespoke with the duration of the course as short or as long as is required. 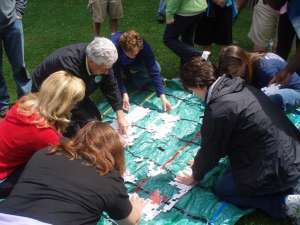 Activities include exercises ranging from five-minute games or week-long retreats, which teach essential collaborative skills while helping employees develop trust in each other and each other’s abilities. Outdoor pursuits, raft making, gorge walking, rock climbing are just a sample of the activities on offer.